In this six-session video group study, designed for use with the Sacred Parenting Participant's Guide, Gary Thomas will help you and your group look at parenting from a different perspective: not about successfully raising perfect children, but about you becoming more holy. Parenting a child is an in-depth course on spiritual formation, expressly designed by God to shape your soul in ways you cannot imagine. What if one of God's primary intentions for you as a parent isn't about successfully raising perfect children, but about you becoming more holy? 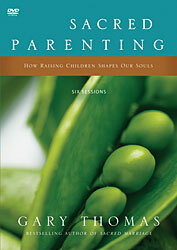 Sacred Parenting helps you look at parenting from a different perspective. In this six-session video group study, designed for use with the Sacred Parenting Participant's Guide, award-winning author Gary Thomas offers a roadmap to spiritual growth through the children that God has given you to parent. Sacred Parenting will help you and your group learn how God can transform dirty diapers, a toddler's tantrums, and a teenager's silence in order to transform you into a person who reflects the image of Christ.